Countertop Warming & Baking Oven Add more baking capacity to your operation instantly with the NEMCO Countertop Warming and Baking Oven. Just plug into a standard outlet. Durable stainless steel unit takes minimal counter space with no ventilation required. Thermostat control to 700°F with independent on/off switches for upper and lower heating elements. Comes with two 15-inch by 15-inch shelves; holds up to four. 6200 Warming & Baking Oven 19 12" x 20 1/2" x 22 120 volts, 1500 watts, 12.5 amps, 80 LBS Suggested Uses: Perfect for heating pizza, cookies, pastries, rolls and fresh breads, pies, toasted sandwiches and other precooked items. 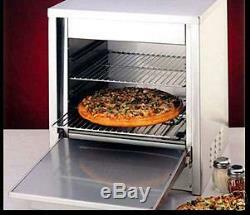 The item "Nemco Warming & Baking Oven #6200 great for PIZZA" is in sale since Sunday, January 11, 2009. This item is in the category "Business & Industrial\Restaurant & Catering\Commercial Kitchen Equipment\Cooking & Warming Equipment\Ovens & Ranges\Pizza Ovens". The seller is "concessionobsession" and is located in Hicksville, Ohio. This item can be shipped to United States, Canada. Return policy details: contact seller for full details.